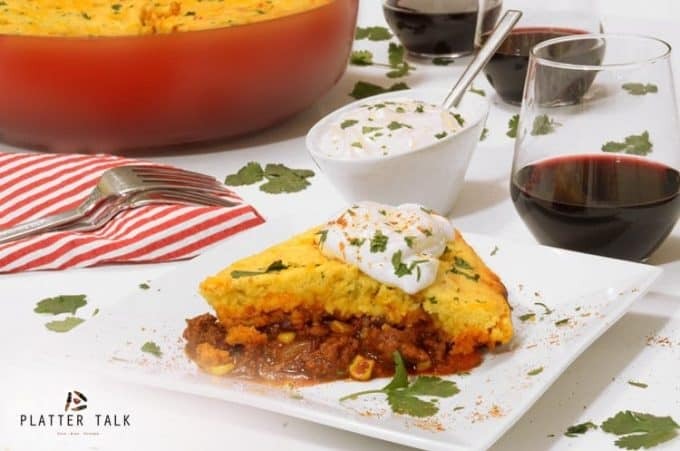 This chili and cornbread casserole features the classic combination of a hearty chili topped with a Jiffy cornbread mix. As a bonus, this cornbread chili is easy and super cheap to make. If you are wondering what to do with leftover Chili, this easy cornbread casserole is your answer! When cold weather comes, comfort food rules at our house and this Jiffy cornbread recipe always hits the right spot. I call this Dutch oven chili a one-pot wonder and my whole family calls it delicious. 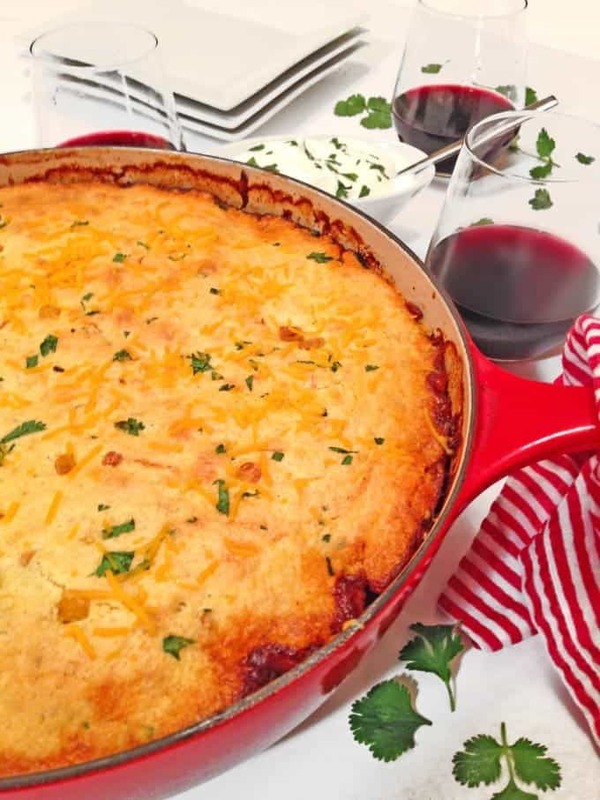 This Jiffy cornbread casserole has leftover chili inside! 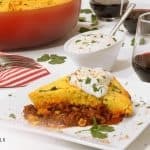 This chili cornbread casserole is also the perfect leftover chili recipe that starts on the stove top and finishes in the oven. You can use your favorite leftover chili as a base and then mix up a batch of cornbread for the topping. I took the convenience route and threw a boxed mix of Jiffy brand together. 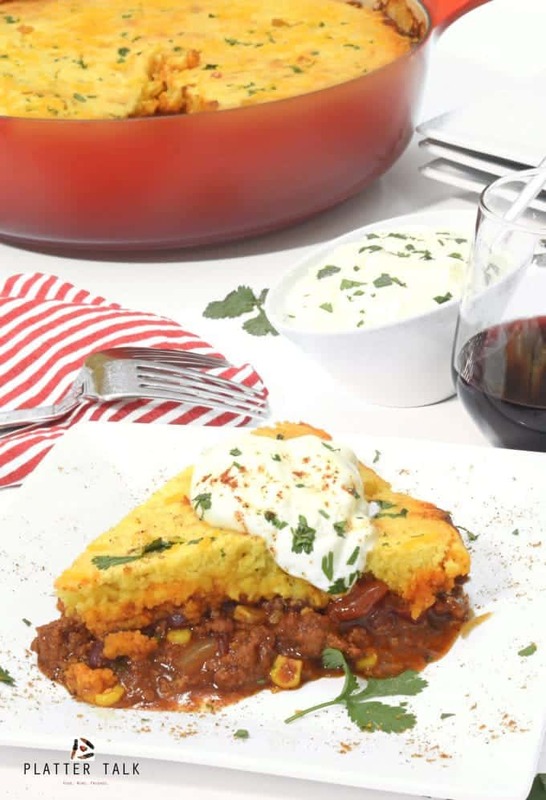 Use leftover chili or make a new batch for this chili and cornbread dish. For the base of this chili cornbread casserole, I use a combination of browned pork and beef, along with some aromatics and cilantro. This all combines to created a mouthwatering Mexican cornbread casserole. Heat from the chili and flavor from the cilantro turns this into a Mexican cornbread casserole. Still, I jazzed it up a bit by roasting about half of the corn in the oven, while the chili cooked on the stove. This roasted corn was later mixed into the cornbread batter. This gives it an added natural sweetness and some nice texture, both adding substance, and flavor to the meal. Our kids refer to this meal as Mexican cornbread casserole. It’s got all the flavors of one! 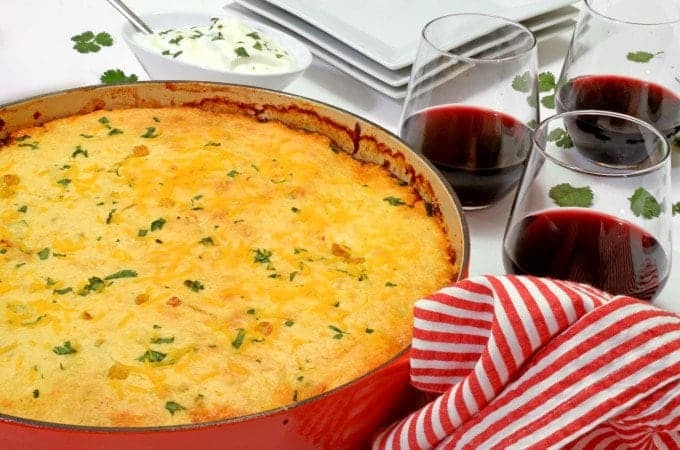 A big dollop of sour cream makes this Jiffy cornbread casserole even tastier! My mother-in-law was in town when we made this, and one of the things that she loved about this Jiffy cornbread casserole was how the boys devoured it. Make it in one pot. If you’re looking for a base chili recipe, have a look at our Chili Cook-off that we sponsored a few years ago. 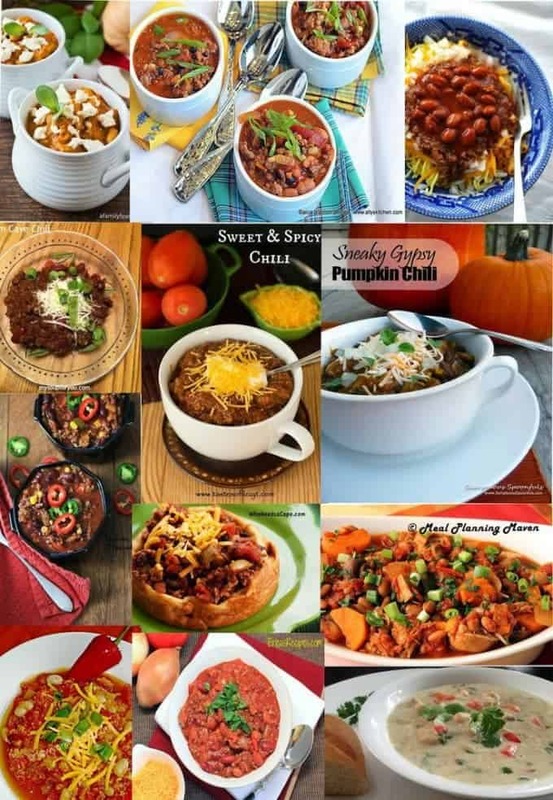 There are over 30 great chili recipes in the collection, one for everyone’s taste. Next time you’re wondering what to do with leftover chili, make this Mexican cornbread casserole. Make this cornbread casserole with leftover chili in just over an hour. Follow this link for more Jiffy recipes. 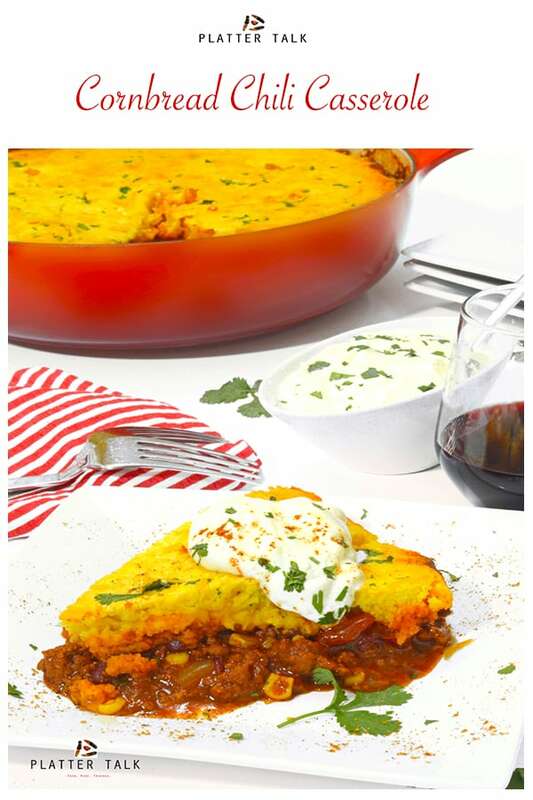 This easy jiffy recipe for chili cornbread pie is a one-pot wonder that will satisfy even the hungriest of crowds. A great use of leftover chili, this meal can be made for about $1.50 per serving. Using large oven-safe skillet, heat olive oil over medium-high setting. Add onion and garlic, sautée until onion is soft and translucent. Add beef and sausage, brown while stirring. Drain or reduce excess fat or water, if present. Add chicken broth, diced tomatoes and chili seasoning and bring to a boil while stirring then reduced to low simmer. Stir in tomato paste and stir until thickened. Add remaining corn, kidney beans and cilantro to meat mixture and mix well. Pour cornbread mixture over chili. Place in oven and bake 35-40 minutes, until golden brown on top. Remove from oven, allow to sit for 10 minutes. I see that one can of diced tomatoes is listed twice on the ingedients, are we suppose to use 2 cans? Hi Lynn, thanks for pointing out the redundancy, it should be just one can. True comfort food! I love that it is so hearty too, the cornbread topping is simply genius! 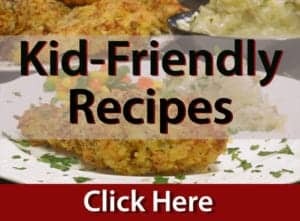 I love super easy and cheap recipes. They usually turn out to be one of the most delicious ones. Such a treat to find your recipe before the holidays! What a great looking dish! It sounds like pure comfort food. This is the type of meal that warms you up from the inside out. I’ll be making this recipe soon. That is a complete meal in one pot. The sauce on the bottom cornbread on the top. How awesome is that? Perfect weekend meal when you lazy to cook. This is an amazing looking comfort food! I love how budget friendly it is, too. We do a chili cook off every year and the one rule it no repeats. I have run out of ideas until now. I am so going to make this (and win!). This pie is such a great idea! It looks so comforting and hearty meal! Everyone in my family will love it! I make a similar recipes and it is so perfect on a cold night. Filling, hearty, and cozy. Yum! 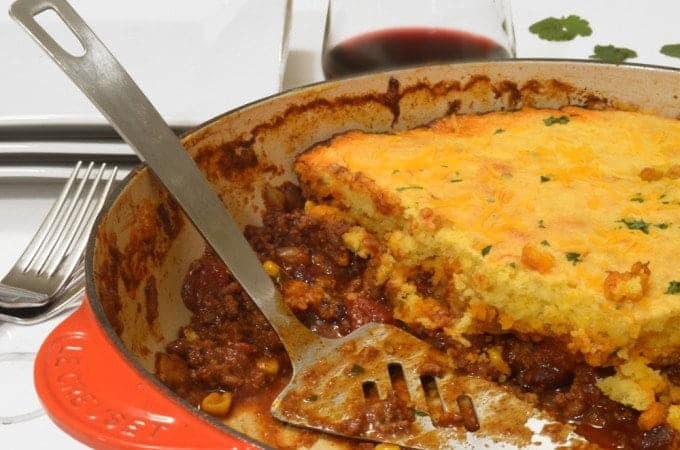 I love comfort food and this shouts it with chili and cornbread its a match made in heaven! “My family calls this delicious” LOL that’s a great line. 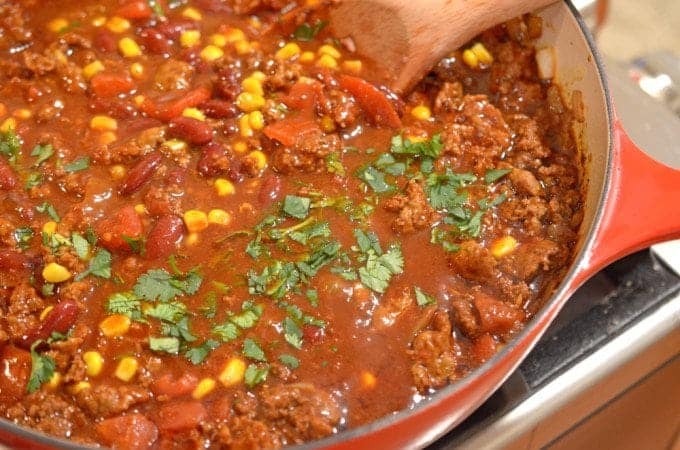 I’ve made a similar recipe with taco meat but this chili version sounds perfect for the cold damp nights we have in Ohio. 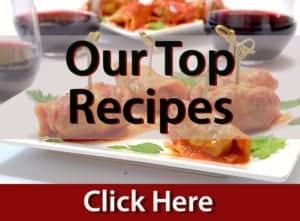 Oh God, I add your recipe to my favorites. I want to eat it every day! This is so delicious and it makes my mouth watering. Love this. Chili and cornbread go great together! Why not make a meal of it! Great recipe!